TCA College is located within the premise of Trinity@Paya Lebar. Free parking is available within the premise. The station is located at the junction of Upper Paya Lebar Road and Tai Seng Link. 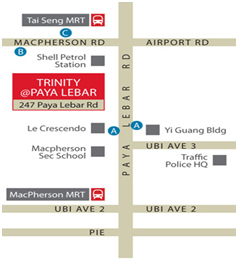 Trinity@Paya Lebar is approximately 5-7 minutes walk away from the station. Trinity@Paya Lebar is approximately 7-10 minutes walk away from the station. Keep left after the second traffic light and immediately after Le Crescendo condominium, turn left into Trinity@PayaLebar. Keep left along Paya Lebar Road and immediately after Le Crescendo condominium, turn left into Trinity@PayaLebar.